For people who like to create like you and me, paper crafts are a joy. Paper is easy to work with and it has so much potential. Crafting offers us an escape into our own little world and it’s the greatest stress buster. This page is the freeway to all of the projects on this site that use stencils in conjunction with paper crafts. You’ll find craft patterns, scrapbooking ideas, card making projects and much more. So let’s get started. Card making is probably the first craft using paper that we are introduced. Remember making cards for your parents in school. Yeah, yeah! But now that you are older and more creative just look at what you can do. It’s no longer the crayon images scratched out on a folded piece of construction paper. You can create an ornate, heart felt, personalized sentiment. Check out these ideas! Just because you are working with paper doesn’t mean that your artwork will be short lived. 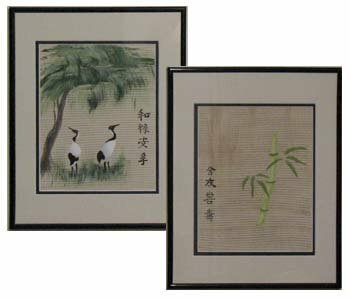 You can create art prints to frame and hang in your home! Yes, you can and here’s how. It’s easy with stencils! Remember making paper snowflakes when you were a kid. Even growing up in the South we made them (maybe because we never saw the real thing). Well, now we’re older and more creative but we can still make paper snowflakes. Come join us for some fun ways to put them to good use. I talked about card making above but if you are working on holiday projects don’t miss this section on Christmas Card Ideas. Using a mask pattern to create paper masks is fun! Find a scary face stencil and turn it into a mask for Halloween, create a mask for Carnival or just any time you want to Masquerade. You can have a real blast getting the kids involved with this paper crafts project. Making masks from paper is a fun and quick way to get your Halloween costume started. 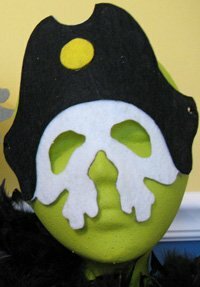 Here's a Free Pirate Skull Mask Pattern for you to give mask making a try. This one was made from felt but there is no reason it can't be made from colored paper. Are you into Scrapbooking? You have to see this video from Club Scrap that merges stenciling with stamping. It features a Christmas related project but you can incorporate the ideas into any of your scrapbooking or other paper crafts projects throughout the year. I truly hope that you find inspiration from these paper crafts and stencils projects. And hey! Don’t forget that I (and everyone else) want to see what you have done with your Stencils. Just click on Contact Me to get your masterpiece showcased here on this web site. Won’t that be exciting! Or if you have any questions or want to share information join in on the Stencil Blog. Well, I hope to hear from you soon. P.S. 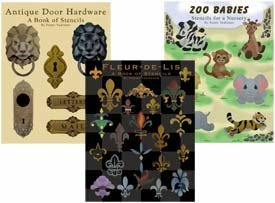 If you're looking for Stencil Pattern Books in Print (like these) then visit our Printer's Book Shop. These books are easy to follow and come with complete instructions. You'll find all of the stencil designs used as examples on this site. Or if you'd rather get your stencils now and print them on your computer (no waiting on the mailman or shipping fees), check out the Stencils Catalog. Return to Home Page from Paper Crafts.